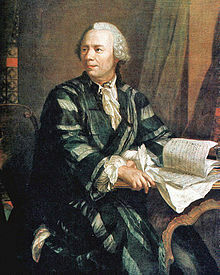 Hi Leonhard Euler (kaluwas Oiler) (Abril 15, 1707 – Setyembre 7, 1783) amo an usa ka Swisa nga matematiko ngan pisiko. Ha Rusya ngan Alemanya hiya nag-ukoy haros bug-os niya nga kinabuhi. Hi Euler damo an iya nahalikwat matungod han calculus ngan topolohiya. Fraser, Craig G., (2005), "Leonhard Euler's 1744 book on the calculus of variations" in Grattan-Guinness, I., ed., Landmark Writings in Western Mathematics. Elsevier: 168–80. Gladyshev, Georgi, P. (2007), "Leonhard Euler’s methods and ideas live on in the thermodynamic hierarchical theory of biological evolution," International Journal of Applied Mathematics & Statistics (IJAMAS) 11 (N07), Special Issue on Leonhard Paul Euler’s: Mathematical Topics and Applications (M. T. A.). Gautschi, Walter (2008). "Leonhard Euler: his life, the man, and his works". SIAM Review 50 (1): 3–33. Bibcode:2008SIAMR..50....3G. doi:10.1137/070702710. Krus, D.J. (2001). "Is the normal distribution due to Gauss? Euler, his family of gamma functions, and their place in the history of statistics". Quality and Quantity: International Journal of Methodology 35: 445–46. du Pasquier, Louis-Gustave, (2008) Leonhard Euler And His Friends, CreateSpace, ISBN 1-4348-3327-5. Translated by John S.D. Glaus. Reich, Karin, (2005), " 'Introduction' to analysis" in Grattan-Guinness, I., ed., Landmark Writings in Western Mathematics. Elsevier: 181–90. Richeson, David S. (2008), Euler's Gem: The Polyhedron Formula and the Birth of Topology. Princeton University Press. Simmons, J. (1996) The giant book of scientists: The 100 greatest minds of all time, Sydney: The Book Company. Thiele, Rüdiger. (2005). The mathematics and science of Leonhard Euler, in Mathematics and the Historian's Craft: The Kenneth O. May Lectures, G. Van Brummelen and M. Kinyon (eds. ), CMS Books in Mathematics, Springer Verlag. ISBN 0-387-25284-3. "A Tribute to Leohnard Euler 1707–1783". Mathematics Magazine 56 (5). November 1983. Weisstein, Eric W., Euler, Leonhard (1707–1783) from ScienceWorld. O'Connor, John J.; Robertson, Edmund F., "Leonhard Euler", MacTutor History of Mathematics archive, University of St Andrews, http://www-history.mcs.st-andrews.ac.uk/Biographies/Euler.html. Ini nga pakli kataposan nga ginliwat dida han 11:39, 23 Enero 2015.